Then again, familiarity does have it’s merits. B is probably the only person I know who would instantly laugh if I said the words Business Socks, or Hiphopopotamus. Me, I actually quite like routine. To indulge in the unfamiliar is to break away from those things you find so comforting and safe. Ergo, when you have a handful of potatoes, make creamy mash or if it’s a few sprigs of rosemary, pair it with garlic in a lamb roast. Following this automatic train of thought, when B brought home some overripe bananas, I instantly thought of making banana bread. What stopped me was the fact that I had recently been making many loaves of said bread at work, and didn’t fancy repeating the task at home. So, I made banana jam. Not terribly groundbreaking. But a nice change from routine. If unlike me you’re not yet tired of making banana bread, you could always try this recipe. Place all the ingredients in a heavy-based saucepan. Warm gently over low heat, stirring, until sugar dissolves. Increase heat, bring to a simmer, and stir continuously with a flat-bottomed spoon until jam reaches 105’C on a sugar thermometer. Remove from heat and set aside to cool. 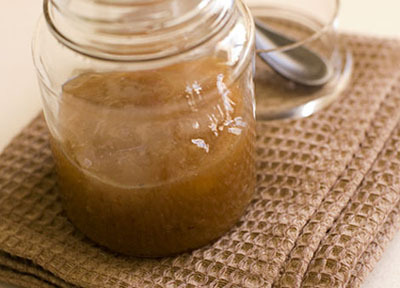 Pour into a clean container or a sterilised glass jar and refrigerate. Banana and Honey Jam is my contribution for this week’s WHB, hosted by Margot of Coffee and Vanilla. That looks so simple and soooo good! Have to try that. Wow, we always listen to that album while playing scrabble! I don’t know why with scrabble, but whatevs. These sound like they’d go EQUALLY well with scrabble!! I had no idea that bananas were herbs. The jam sounds delicious, great post. Cakespy: Haven’t played Scrabble in ages and ages (the dust on the board is probably an inch thick by now!) but when we do, definitely no music allowed because music is a distraction and distractions lead me to picking up letters like Q and X from the bag, dammit! Hah! My sister was just asking me whether banana jam was possible and I said I didn’t know…but now I do! Will have to try and pick up some extra bananas at the markets next weekend! Sounds and looks delicious! I am just done it loquat jam so now on the bananas! Thanks for the recipe!